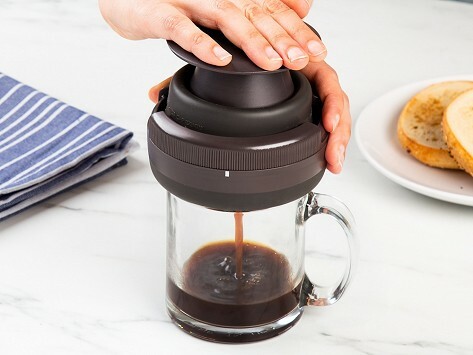 This reusable personal coffee press lets you enjoy a coffeehouse-quality brew at home or anywhere you are. It’s a simple way to hand-pour one cup at a time. Fill it with coffee grounds and hot water and wait for three minutes. Flip it over onto a cup or mug, press down, and that’s it—now sipping a daily cup of craft coffee is easy (and delicious). PLEASE remove my previous review or amend with my apology. So far he is totally impressed...makes a delicious strong cup with no bitterness...and it travels well. Makes a full-bodied cup of coffee. A great product. Portable too! Hand-pouring coffee is considered a craft approach because the process of hot water passing slowly through the grounds extracts more of the coffee’s flavor and aroma. Maker Jessica Do Tully was a fan of buying hand-poured coffee and wanted to create an unfussy way to make this special cup an easy addition to an everyday routine.